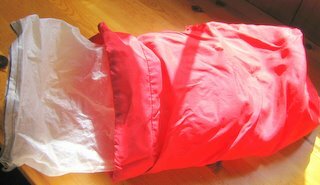 I’ve been using an odor proof sack to line my food-bag, since 2003. They are supposed to be odor proof so the animals can’t smell your food. I sleep with my food so it is a comfort to me to believe that the bears can’t smell my food bag; I don’t really believe it but it is a comfort never the less. Anyway it’s good to know that if anything gooey breaks open in my food bag that it is contained and won’t leak all over my gear. I buy the 12X20 size. The closure breaks right away but I just roll the bag under and call it good. The rest of the bag will last for an entire thur-hike.